Late last night, Board of Education Member John Newkirk sent an email regarding his surprise Wheat Ridge Plan B Motion, asserting a claim that information we distributed and sent to the Golden Newsletter needed to be corrected. (Perhaps for PR value he added Communications Chief Nina Pinto and Superintendent Dan McMinimee to the email.) All of this information is contrary to what we’ve previously received so we also asked Board of Education Member Jill Fellman to respond and found a screenshot of what the WREA posted on their own Facebook page. The“Wheat Ridge Plan B” was in fact proposed on December 31, 2014 by the Wheat Ridge Education Alliance (WREA), a group of Jeffco leaders that includes several elected officials, five educators, Board of Education member Jill Fellman, and other community representatives. A copy of the WREA’s proposal and their membership roster is attached. After receiving favorable public input both via letter and during the public comment portion of our March 5 board meeting, I made a motion to compel discussion of the WREA’s proposal. After holding several community meetings, on March 19 the Board chose not to adopt the WREA’s “Wheat Ridge Plan B” suggestion. Not so fast, Mr. Newkirk! Let’s go over the facts and remember that there SHOULD BE a true accountability to the community! We greatly appreciate the opportunity to respond and ensure that ALL parents and community have the ability to actively participate as stakeholders of the public schools their children attend. Shawna, I very much appreciate you giving me the opportunity to clarify any confusion about the Wheat Ridge Education Alliance (WREA) and the process that greatly upset the community. I believe that Mr. Newkirk is unfortunately twisting the facts to try and avoid responsibility for his actions. Let’s look at his allegations, and compare them to the facts. 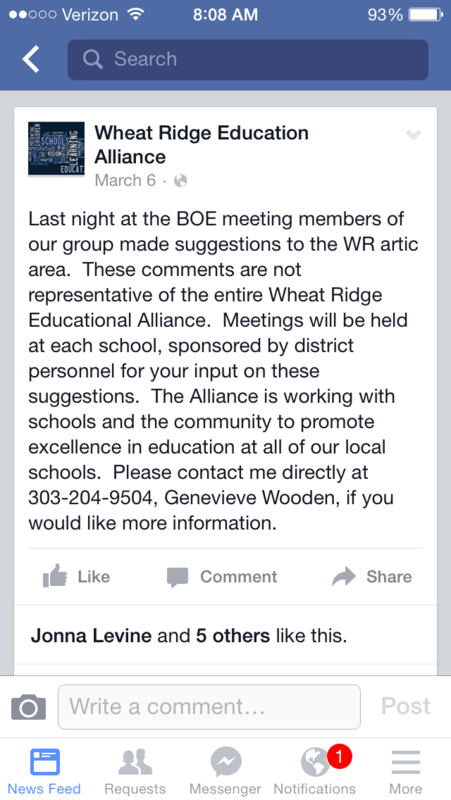 He says the Wheat Ridge Plan B was “proposed on December 31, 2014 by the Wheat Ridge Education Alliance. False. First, the WREA did not meet to discuss or adopt a plan on New Year’s Eve. The letter Mr. Newkirk refers to was only signed by three members of the WREA, and addresses a plan that was not brought before the WREA for discussion or vote. It was a plan of three individuals who happen to be members of the organization. It is possible that an individual might read that letter and conclude that it was in fact a plan discussed and adopted by the WREA. However, when the Board of Education discussed the Jefferson Area Plan at its January 15th meeting, it was clear that this was not the case. And in fact, at that January 15th meeting District staff explained why the plan was not feasible, and was not in the best interests of the schools or the families in the Wheat Ridge area, or the District. There was no further mention of the plan by the Board of Education until March 5th. In fact it had been clear to me that the plan was not going forward. The “favorable public input” Mr. Newkirk refers to is three WREA members sending a letter, and then two of those members speaking about the same issue during public comment at the March 5th Board of Education meeting. His motion to adopt the plan of the three members of the WREA followed this – there was nothing in his motion about a need or effort to engage in public discussion of the plan. Finally, Mr. Newkirk is wrong again when he says that the Board chose not to adopt the plan on March 19th. By that time it was clear that both the District staff as well as the broader community recognized the significant problems with this plan, and Mr. Newkirk withdrew his motion. The most unfortunate part of this whole experience is that it could have been handled more appropriately. Changing school boundaries and building usage is always highly charged and can be extremely emotional for the families involved, as well as the educators and administrators. The three individuals who proposed the plan should have been clear in their initial letter that they were speaking as individuals (as I’ve noted, this became clearer over time). Any Board member who wanted to engage in further discussion and honestly seek public input could have asked the superintendent to do just that. That’s not what happened however. I hope the next time a similar situation arises, the Board of Education will study the issues and reach out to our community for input and advice, before someone makes a motion to approve a plan that has not been vetted and that our staff believes would have negative consequences for the community. Sure, this was another PR nightmare! Hundreds of families upset over a proposal they’d never heard a word about! Changes without input and discussion! A complete lack of accountability and transparency. Community meetings scheduled frantically and family schedules altered dramatically to get to those meetings! Staff time diverted from their work to cover the abundance of fury coming from the parents of children impacted! Capacity issues at community meetings! Not to mention the hundreds of letters to the Board of Education and yet another petition circulating to tell the Board to knock off the nonsense! Probably more effective to let it go and move on (maybe even focus on Board correspondence where people have been waiting months upon months for a response) but instead we are given another opportunity to show that, yet again, here’s another attempt to cover their tracks instead of just being accountable and transparent with the community. Pants on fire! Let the staff get back to their real jobs and don’t create more issues! Jeffco Public Schools is about 86,000 children; we need Board of Education Members who can focus on this reality. Previous PostSetting the StageNext PostWhat children does this serve?